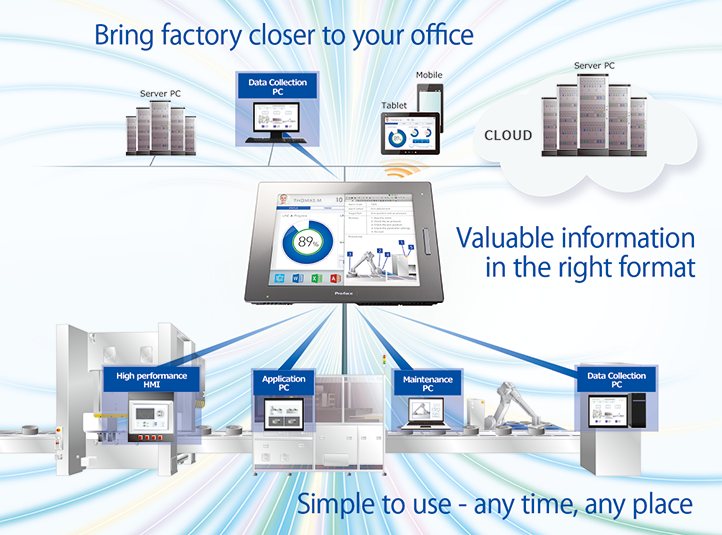 Smart Portal is a gateway terminal that securely connects the two different networks of a factory, the equipment and devices on the manufacturing floor and the production control office. In production sites, HMIs and IPCs have long been used as operation panels. HMIs provide visualized information of devices and equipment. IPCs have been used to processed large amount of data even in tough environments. 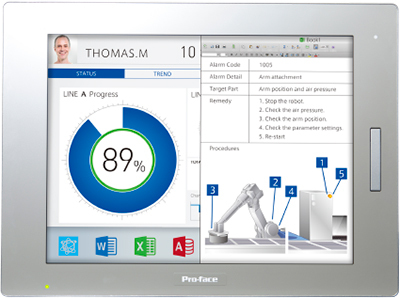 Pro-face offers Smart Portal, which is a new class of interface beyond HMIs and IPCs. The Smart Portal securely connects different networks, and utilizes the big data both in the factory and the office. Information technology (IT) has upgraded the computers and telecommunications equipment in the industrial automation field, and has generated massive data in production sites. In addition, Smart Mobile Devices such as smartphones and tablets have brought accessibility of data and Cloud services have brought diversity for applications which use this data. Pro-face has developed SP5000 Series as the first Smart Portal product for satisfying customers needs utilizing large volumes of data and connecting securely both upper networks (office) and lower networks (factory). SP5000 Series is an interface terminal that can be integrated as a display unit on an operation panel. Equipped with 2 Ethernet ports, SP5000 Series can easily and securely create segmented networks. In addition, SP5000 can stably process production-related big data by combining in one unit the reliability of an HMI and the versatility of an IPC compatible with Windows applications. SP5000 Series will become a core device of Internet of Things (IoT) *1 . IoT will offer advanced connectivity of devices, systems, services such as connectivity in many factories, and connectivity of both production and logistics. In addition, SP5000 Series will be a core device for promoting the Industry 4.0 *2 of the future. In past, achieving productive efficiency and utilizing data in a factory required renovating systems and equipment on a large scale. For connecting the upper network (office) to the lower network (factory), there were issues of cost and time. In addition, recent networking devices have caused security issues such as viruses and information leaks in the industrial field. However, as an operation interface, SP5000 Series can provide connectivity to devices and equipment without renovating equipment and without installing a dedicated gateway. In addition, SP5000 Series can make segmented networking easily, and securely connect different networks. SP5000 Series is brilliant for utilizing production data in both factory and office, with low cost, leading the future of industrial automation. 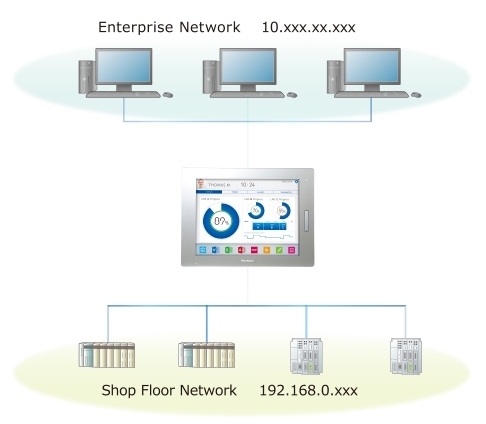 Equipped with 2 Ethernet ports, SP5000 Series makes network segmentation simple. Different IP addresses can be configured for each port, enabling safety to be secured before construction of the network system. For example, installing SP5000 Series between office and factory networks as a gateway helps utilization of both the big data continuously increasing at the production site as control devices get faster, and the continuously increasing big data on the office side of production control with low cost. On an efficient production site, it is the key action to quickly find the cause of alarms for reducing down time. By installing Pro-face Remote HMI Server on any SP5000 Series, PC or IPC, you can use Pro-face Remote HMI to monitor and operate the operation screen on your hand, and also are able to monitor windows applications such as Excel and PDF. For stable operation on operation panels in production sites, there has been used a dedicated OS on HMIs. Therefore it was needed to transform data for connecting with Windows applications. However, SP5000 Series has both compatibility with Windows applications and stable operation for combining data on production and on office networks. SP5000 Series stores the documents you always use to the Smart Portal so that you can utilize them. Use manuals and troubleshooting guides that you already have as they are, without special instruction screens, to drastically cut design man-hours. "The Internet of Things (IoT) is the network of physical objects or "things" embedded with electronics, software, sensors and connectivity to enable it to achieve greater value and service by exchanging data with the manufacturer, operator and/or other connected devices." What is the Industry 4.0? "Industry 4.0 is a collective term for technologies and concepts of value chain organization. Based on the technological concepts of cyber-physical systems, the Internet of Things and the Internet of Services, it facilitates the vision of the Smart Factory." The Smart Portal has a lot of new features. For details, please see the SP5000 page.